Beatles British European Airways Bag (1964). Beatlemania in a carry-on bag, produced by British European Airways. Made to commemorate the Beatles' arrival in the United States in 1964. Not sold to the public. Measures 10" x 13". In Very Good Plus condition with some wearing on the front poach. 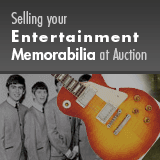 Includes 'Reports and Accounts 1963-64" with pictures of the Beatles in the center. COA from Heritage Auctions.